What do you think this latest offering to the fast food market should be called? Tell us below. Want to have your name up in Mclights? 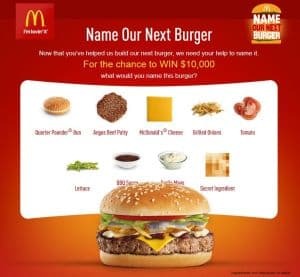 Well now's your chance, McDonald’s Australia wants you to name its newest burger. After a call to find its latest ingredient, the fast food giant now wants you to help name its creation. There's a catch – we don't know what the secret ingredient is. There's another catch – but at least this one is a good one, if McDonald's pick your name you win $10,000. Some people have already taken to social media to give some names to the burger, one Facebook fan has dubbed it the McCardiac Clogger with another opting for McTastesShit.